DO YOU CroCHET OR KNIT? We are in constant need of donated baby blankets. ​Q: I’m ready to make baby blankets to donate to Rachel's Gift. How do I begin? A: We are in constant need of handmade baby blankets - either knitted or crocheted. You are welcome to knit/crochet at your own pace. We do not require you to complete a minimum number each month. We offer a baby blanket in each of our keepsake boxes available at our partnering hospitals, serving more than 700 families in 2017, and nearly 1,000 families in 2018. We anticipate a need for at least 1,300 blankets in 2019. However many you are willing to donate, we will gratefully accept! We ask that you please follow our blanket guidelines as outlined below. Blanket sizes do not have to be exact, but 21 in. x 21 in. is perfect. If you are having trouble scaling down a beloved pattern, no bigger than 25 in. x 25 in. Pale blues, pinks, and purples, either by themselves or mixed with white. Mixed pastels that include pink or blue. Baby yarn is preferred for its softness. 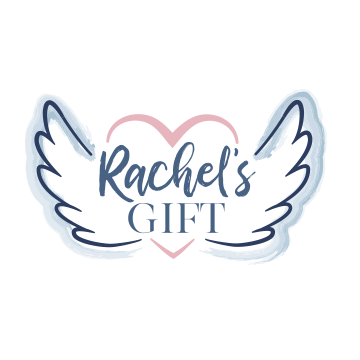 Follow our Facebook community Handmade by Rachel's Gift to share your creations, find inspiration and free patterns, swap ideas, ask questions, and connect with other Rachel's Gift volunteers!